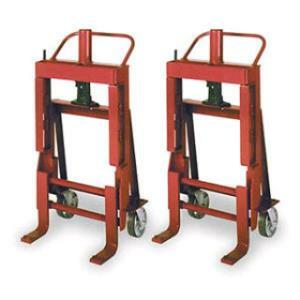 This pair of hydraulic roll-a-lift have a 4000 lb lift capacity with a maximum lift height of 12". Features include swivel casters for easy maneuvering, a hand operated hydraulic jack, and adjustable forks. The pair weigh approximately 325 lbs. * Please call us for any questions on our roll a lift 2000 lb pair rentals in Hillsdale and Ridgewood NJ.